Wedding Planning can be a daunting task and if you don’t know where to start, it can be even more frustrating not knowing exactly what to do and when to do it. 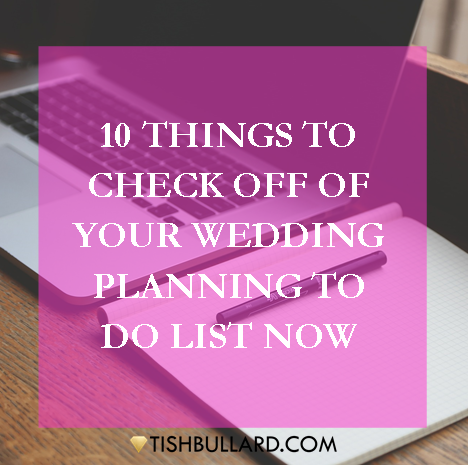 So, I will share the first things that you should make a priority in crossing off on your wedding planning to do list. 1. Write Up Your Guest List. Your guest list is one of the most important elements of your wedding planning. The number of people that you invite to attend on your special day will affect your wedding budget…in a good or negative way. Think of this way, the more people that you invite, the more you will spend. 2. Figure Out Who Will Be Paying for What. Unless you have this hard conversation with your parents and/or your fiance, you can run up against a wall when it is time to make payments and secure your locations and vendors. Schedule some time with your family and discuss who will pay for what aspects of your wedding. 3. Set Your Wedding Budget. Now, that you have your guest list and know who will pay for what, decide on your overall budget. Factors to include are: ceremony and reception locations, floral, stationery, wedding gown, tux, transportation, decorations, linen, cake (of course there are more expenses). Be realistic with your budget. And, know that Weddings Do Cost. Be realistic, be prepared. A professional planner is definitely an investment that you should factor into your budget. A planner on your team comes equipped with the knowledge, tools, and solutions to help you work your budget, create a well executed design plan, and can ensure that the logistics of the day go well. Problems will arise before and during the wedding day and you don’t need the stress of having to work out problems and focus on being in the best frame of mind to get ready for your walk down the aisle. Your professional planner will know what to do, when to do it, and how to get it done often times without you even knowing a problem occurred. 5. Book Your Ceremony and Reception Site. Don’t wait to start visiting the locations where you want to say “I Do” and “I Did’. Make a list of your top locations and schedule your appointments to visit them. Consider the special amenities that you are looking for in each location. And, also take into consideration if the ceremony and reception will accommodate your number of guests and your budget. It never hurts to take along your Planner, he or she knows what questions to ask that will help you determine if your desired location will work you. Will you use your childhood Pastor or a family friend to marry you? Talk this over with your fiance’ and then reach out to the licensed officiant of your choice to see if they are available to marry you. Be sure to inquire about their fee so that you can factor this into your budget. 7. Have Fun and Go Dress Shopping. Schedule a day with your best friend, your mom, and even your future mother-in-law and go dress shopping. Most bridal salons require an appointment so be sure to schedule yours and take a few inspirational pictures with you to help your dress consultant pull some pieces that may just hold the dress of your dream. 8. Set Up In-Person Meetings with Potential Vendors. You may want to take your Planner with you on this one or ask for recommendations. Consider the formality of your event and your budget. If there is a local bridal show in your area, this would be a great time to visit vendors in your area at the show and schedule appointments then. 9. Select Your Bridal Party. Who will you select to stand by you on one of the most memorable days of your life? Will your bridal brigade consist of your family only, college friends, co-workers, or will you forego a bridal party? As soon as you decide on who will stand in as your bridal party members, go ahead and contact them and invite them to join you. 10. Hire Your Stationery Designer. Will you DIY your Save the Dates and Invitations or will you hire a professional? It can typically take 4-6 months to receive custom stationery so if you are going to go custom, hire your designer as soon as you can. If you are planning “Do-It-Yourself” stationery, start early so that you can decide what works and what doesn’t. No worries if it doesn’t work out, you can still call on a professional to help you brand your event.